The Pinwheel Galaxy (Messier 101, NGC 5457) in the Big Dipper (Ursa Major) is one of the most remarkable grand design spiral galaxies in the sky (morphological type: SAB(rs)cd), its size is seventy percent larger than The Milky Way, while its distance is about only 25 million light years. Perhaps this is the reason why M101 was one of the first objects characterized as 'spiral nebula'. After Pierre Méchain discovered the galaxy in 1781, Charles Messier included it in the final edition of his catalogue (Catalogue of Nebulae and Star Clusters), as one of the last entries added by Messier himself. In 1784 William Herschel described the object as 'mottled', he was hoping to be able to resolve the nebula to individual stars which he thought the object is composed of. William Parsons, the third Earl of Rosse characterised M101 as 'spiral nebula', based on his observations with his 72" Newtonian reflector, making the galaxy one of the first objects described as spiral. Although the galaxy is bright and its apparent diameter is about 2/3 of the full Moon, only the symmetrical central region of the galaxy can be observed easily. Outer spiral arms become visible in larger telescopes under very dark skies. The outer arms show asymmetrical characteristic, and are highly scattered. Early observations of the brightest knots and patches in the outer arms of M101 could not reveal the connection between the knots and M101, making them be catalogued under separate catalogue numbers, even in the NGC (New General Catalogue of Nebulae and Clusters of Stars). Parts of M101 being catalogued under own numbers in NGC: 5447, 5449, 5450, 5451, 5453, 5455, 5458, 5461, 5462, 5471. 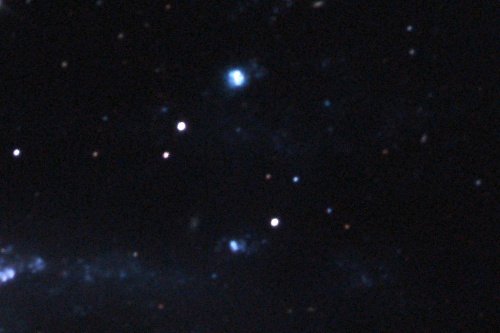 NGC 5471 is shown in the detailed image on the right, it is the bright patch in the upper-half of the picture. Close to NGC 5471, a very distant group of at least four galaxies (galaxy group SDSSCGB 10568) can be seen, unfortunately I could not find relevant data about their distance. 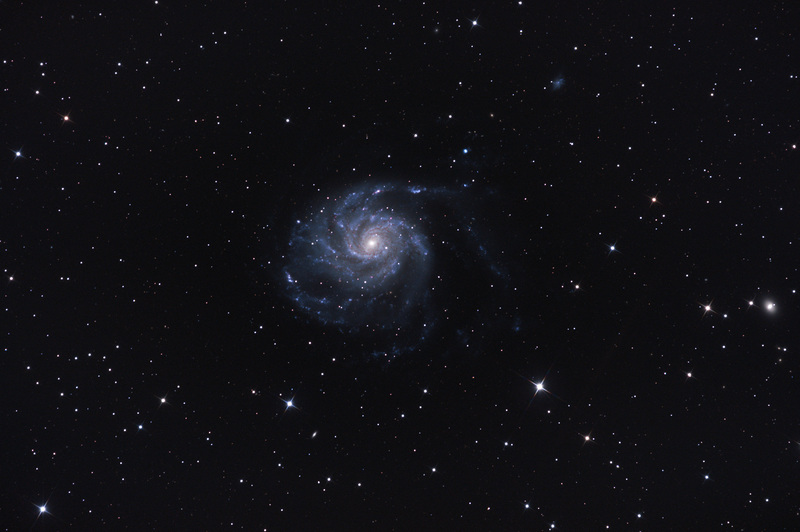 M101 is also rich in molecular hydrogen. Distribution of the gas is not uniform in the galaxy, it is concentrated in about 3000 regions, where hydrogen is being contracted by its own gravity, resulting in high density and high temperature, a good condition for star formation. Ultraviolet radiation from young stars ionise the remaining of the gas cloud around them, making the HII regions shine in red. Tidal forces from satellite galaxies amplify density waves in the spiral arms of M101, helping the compression of HII regions. In the picture of the galaxy these regions can be seen as red filaments in the arms of the galaxy. The asymmetry of the outer arms is a result of tidal forces caused by satellite galaxies of M101. There are at least 9 companion galaxies of M101, the most prominent ones are NGC 5204, NGC 5474, NGC 5477 and NGC 5585. NGC 5477 and NGC 5474 are the closest ones to M101, having the most influence on, and suffering the strongest distortion by M101. Unfortunately only one of the prominent satellite galaxies could fit in the field of view of the picture, the others are not shown here. 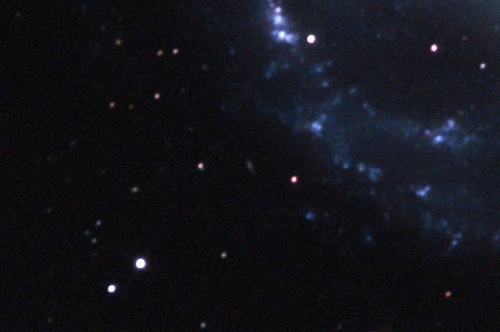 NGC 5477 is the one that could fit, and can be seen in the detailed image to the right. Note the irregular, distorted figure of it, which is caused by the gravity of M101. Its disc is also offset relative to its nucleus because of the gravitational interaction between the galaxies. 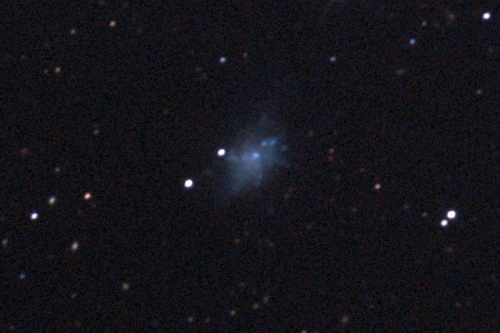 The other satellite galaxies have very similar look, their discs are also a bit displaced to their cores due to the gravitational force of M101, and they have irregular look too. There are also a lot of distant background galaxies in the picture, some of them have more galaxy-like look, while the rest of them (the more distant ones) are only a small patch of a few pixels. According to Hubble's theorem, more distant objects seem to move away from the observer at higher speeds, thus the colour of them is shifted towards red due to the Doppler effect. 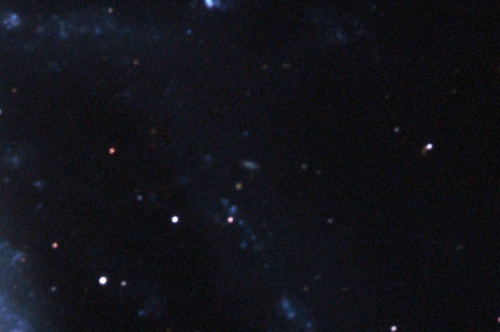 The brightest background galaxy in the picture is a lenticular one, catalogued as NGC 5473, visible at the right edge of the picture, its distance is about 90 million light years. There is a star visible in front its disk, that star is part of our galaxy, and is much-much closer to us. 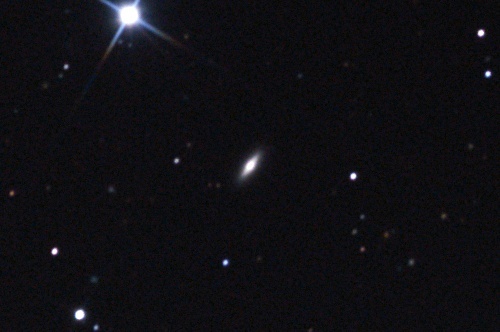 The small lenticular galaxy referred as MCG+09-23-025 (shown below) is about at the same distance as NGC 5473, but being much smaller in size, it looks much smaller in the picture too. Some of the background galaxies are visible through the lower density parts of M101, like the two SDSS galaxies in the pictures below.